The artist’s work sells for millions, so no surprise that his posters for Barcelona’s last bullfight are disappearing from the streets. His paintings sell for up to £4m, but a limited edition copy of Spanish artist Miquel Barceló’s latest work can be had for free – if you know how to peel posters  off walls without tearing them. Barceló’s 1,500 posters appeared glued onto hoardings, pillars and walls in Barcelona this week after Spain ‘s most commercially successful artist volunteered to design what is set to be the last-ever bullfight poster to decorate the city’s streets . With bullfighting  to be banned in Catalonia at the end of this year, Barceló asked to paint the poster for the Catalan capital’s last bullfight. The fight, on Sunday, features Barceló’s friend José Tomás as one of the three matadors. It closes the season, and marks the death of bullfighting at the city’s Monumental bullring. Barceló’s poster has provoked a frenzy of art madness, with fans of both the artist and bullfighting desperately trying to get their hands on what is already a collector’s item. Queues have formed outside the offices of the fly-posting company charged with pasting them onto the city’s walls. José Tomás is one of the most popular matadors of the moment, and is especially adored by those bullfight-loving artists and intellectuals who criticise the Catalan ban for censoring what they see as an art form. 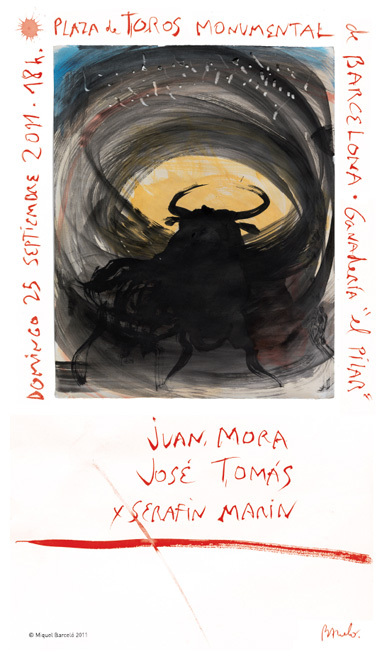 Barceló, whose works sell for more than those of any other living Spanish artist, designed another poster for Tomás in 2007, when the bullfighter came out of a five-year retirement. Tomás is a famous risk-taker and only recently came back after 15 months recovering from a goring suffered in a Mexican bullring. Barceló’s most valuable paintings are bullfight scenes, with one fetching £4m at Christie’s in London this June . They continue a Spanish tradition that stretches back through Pablo Picasso to Francisco de Goya.